Growing up the trade fair was a special event. It was a must to attend and to prove you were there you had to wear the tattoo. Yes l am talking about the face paint to signal that you were also there. Even now the trade fair is still a to-go event in my calender. This year l was fortunate enough to go to the trade fair again. Believe me unlike the other years it was touch and go for a moment. Yes paying five dollars for the ticket almost killed me. I am a young girl who has to leave on a tight budget five dollars is not some spare change for me. 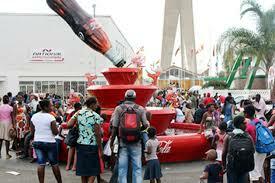 What l like most about the trade fair is how it brings Bulawayo to life. People come from all corners of Zimbabwe to enjoy this day as a family. It is a special event which draws crowds. Even us the Bulawayo people who love staying at home and hanging out with friends make an exception on this day. Let me tell you this librarian enjoyed her day at the trade fair and though she got robbed (who pays two dollars for a picture) the toffee apple she enjoyed washed away all the worries she faces. If only book fairs in Zimbabwe were so widely publicised and promised us delicious treats. We need to take a page from the ZITF mix business with pleasure it produces a very delicious cocktail.